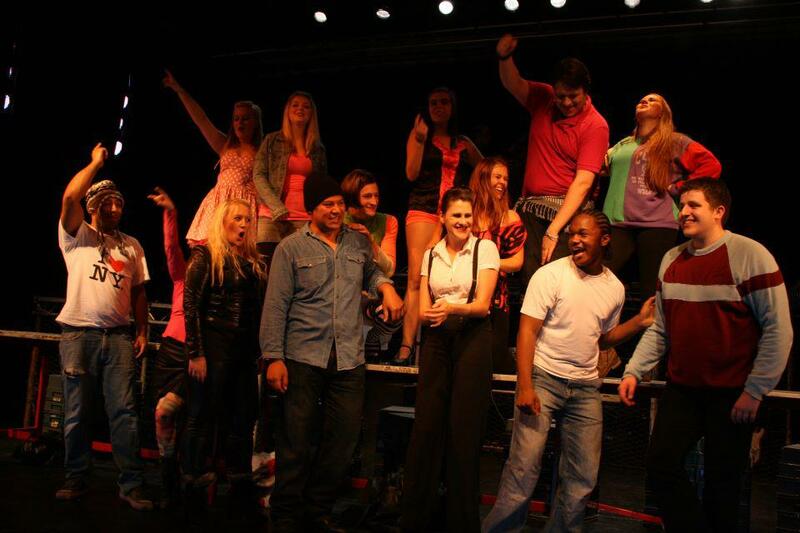 I choreographed Rent for Bromley Players. We were awarded the NODA flame award for our region for this show. Rent is set in the 1990’s in New York city. It follows a group of friends who are struggling artists & addicts. This is not a light subject matter and focuses and AIDS, homosexual relationships and drug addiction. This is is great show for you if you have strong singers with a good belt/rock voice. The boys – Mark, Roger, Collins & Angel are all very distinct. Some societies may struggle to cast their Angel – a cross dressing man who can dance, sing and act….whilst wearing heels but this part is the real heart of the show. Mark & Roger are also not easy sings and Roger especially is required to hit some high notes. The girls Mimi, Joanne and Maureen are also great parts to play although the girls playing Joanne and Maureen have to be comfortable playing opposite another woman. This show can just be performed with the principles named above as well as Benny and another 4 actresses/actors playing the other small cameos that appear throughout. However that being said it is a show where if sharing the cameos around there is at least another 10 opportunities for different people to take a variety of solo roles. Chrous are easily added into numbers as desired. For example in Mimi’s number ‘Out Tonight,’ we added 4 other dancers and La Vie Boheme had around 12 members of the ensemble on stage with the leads. This is another of these shows where the set can be fairly flexible. A lot of productions are performed with just a use of levels and in the one I choregoraphed we simply used different level rostras, 3 large packing tables and some crates for chairs and other items as and when needed. I do no thtink you want the set to look to polished as it takes away from the grit of the show. Consequently the set for this production can be done with imagination but not much cost. A lot of the cast supplied their own costumes however there are a few particular things you will need to source. Most of these revolve around the part of Angel who is supposed to make their own clothes. You will also need to invest in some heels that fit a man. (I would suggest Shoe Zone in the UK). Some looks are also iconic including Mimi’s skin tight electric blue leggings and Marks striped jumper – whilst they are not essential to the story line a lot of people come expecting them. On the whole this is very cheap to costume. There is no specific technical requirements for this show however I would say that a good lighting rig and strong sound equipment is a big bonus! The band comprimises as 2 keys, 2 guitars, bass guitar and prcussion although it states that guitar 2 and keys 2 can double. The director on this matter just needs good imagination and creativity as it can be staged in so many ways. The M.D needs a good grasp of a big rock sound. There is not a large amount of dance in this show but the choreographers biggest number is La Vie Boheme so you need someone that can move large amounts of people well, including people that may not be dancers. Rent can be a difficult sell. Due to some of the issue it tackles it is not a show that is going to appeal to everyone. On top of this it is not a family friendly show. When I was on the production team we did not do a Saturday matinee for example. 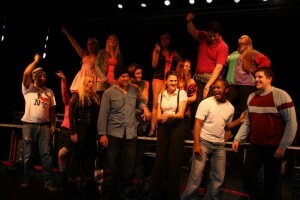 This is probably one of the most rewarding and enjoyable shows I have been part of. Whilst it is not a show that pull the crowds in, it can be cheap to put on. It is also a great show to showcase strong rock lead singers if you have them in your society. Interesting and helpful comments. We are trying to choose our next show, and this was quite enlightening to someone like me who doesn’t know the show at all. Glad it helped- do let me know if you go to see it and what you think of it!